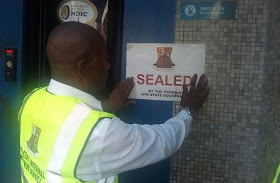 No fewer than 13 banks in Ibadan, the capital of Oyo state, were denied access to commercial transactions, while commercial activities were paralyzed in others by officials of the Oyo state government on Monday. Commercial activities had barely begun when the combined teams of the task force of the Inter-Ministerial Law Enforcement Unit of the State of Oyo were launched on financial institutions to enforce tax compliance. As early as 9 a.m., no less than 20 different branches of the various banks had been closed with sealed notices placed on the property. Some of the areas in which the application team carried out its activities include Dugbe, Mokola, Idi-Ape, Agodi Gate, Secretariat Road, Challenge, Jericho, Bodija and UI. Other areas visited where the branches of the affected banks were located are, Aleshinloye, Bodija Market, Orita-Challenge, Ring Road and Total Garden axis. Some of the affected banks include Diamond, Stanbic IBTC, Skye, FCMB, Heritage, Eco, Fidelity, UBA, Union and Standard Chartered. Officials of the affected banks were seen running to order their papers to avoid losing all day. While some managed to make the necessary payments as quickly as possible to resume operations, some others continued to try to reach the higher authority for a new directive.